Inti Create is bringing Azure Striker Gunvolt onto PC via Steam. The PC version will be improved while adding in new additional features. Anyone who purchases the game between August 28 to September 28, 2015 will receive a copy of Mighty Gunvolt. 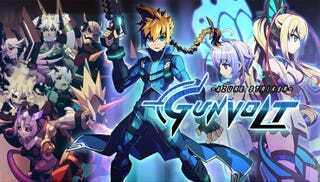 From Japanese game developer Inti Creates comes the 2D side-scrolling action game, Azure Striker Gunvolt! With the “septimal” power to create and manipulate lightning, Gunvolt faces off against the massive conglomerate known as the Sumeragi Group. Intense battles unfold against Sumeragi’s ultra-powerful adepts (those who possess septimal powers) as Gunvolt fights to keep his nation free. Sumeragi’s most powerful members, with a wide range of personalities, await you at the end of your missions. Even Gunvolt falls in battle sometimes. Enter the heroine Lumen, whose songs give Gunvolt the strength to get up and fight once more. If you manage to avoid damage and build up a lot of score, the BGM will change midway through the stage to one of Lumen’s songs. Gotta keep that no damage hype train rolling right along! With the addition of Speedrun Mode, it’s time to put your electrifying skills to the test. Future updates will expand the capacities of this mode, so keep an eye out for those as well! Enjoy the original Japanese version of the game complete with Japanese voiceovers and ample mid-stage dialogue, all translated into English.